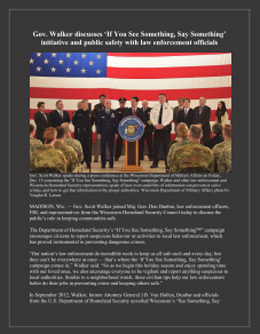 In July 2010, the Department of Homeland Security (DHS) launched a national "If You See Something, Say Something" public awareness campaign –a simple and effective program to raise public awareness of indicators of terrorism and violent crime, and to emphasize the importance of reporting suspicious activity to the proper state and local law enforcement authorities. To augment the national “If You See Something, Say Something” campaign in Wisconsin, the Wisconsin Fusion Centers have instituted WiWATCH to provide a portal to educate the public and provide a means to report suspicious activity. 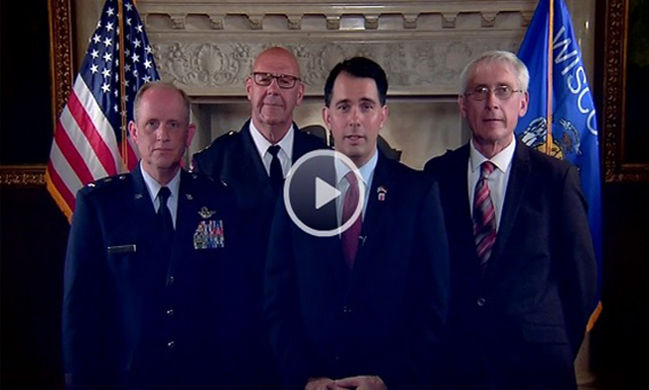 A critical element of the missions of the Wisconsin Fusion Centers is ensuring that the civil rights and civil liberties of persons are not diminished by our security efforts, activities, and programs. Consequently, the "WiWATCH" campaign respects civil rights and liberties by emphasizing behavior, rather than appearance, in identifying suspicious activity. WHAT IS SUSPICIOUS BEHAVIOR OR ACTIVITY? Questioning individuals at a level beyond mere curiosity about particular facets of a facility’s or building’s purpose, operations, security procedures, etc., that would arouse suspicion in a reasonable person. Interactions with or challenges to installations, personnel, or systems that reveal physical personnel or cybersecurity capabilities. Building operations teams and contacts, personnel data, banking data, or travel data. Taking pictures or video of facilities, buildings, or infrastructure in a manner that would arouse suspicion in a reasonable person. Examples include taking pictures or video of infrequently used access points, personnel performing security functions (patrols, badge/vehicle checking), security-related equipment (perimeter fencing, security cameras), etc. All reporting on photography should be done within the totality of the circumstances. Demonstrating unusual interest in facilities, buildings, or infrastructure beyond mere casual or professional (e.g., engineers) interest such that a reasonable person would consider the activity suspicious. Examples include observation through binoculars, taking notes, attempting to measure distances, etc. Acquisition of unusual quantities of precursor materials, such as cell phones, pagers, fuel, and timers, such that a reasonable person would suspect possible criminal activity. Attempts to obtain or conduct training in security concepts (military weapons or tactics) or other unusual capabilities that would arouse suspicion in a reasonable person. Discovery of unusual amounts of weapons or explosives that would arouse suspicion in a reasonable person. Actions associated with a characteristic of unique concern to specific sectors (such as the public health sector) with regard to their personnel, facilities, systems, or functions. Unauthorized personnel attempting to enter or actually entering a restricted area or protected site. Impersonation of authorized personnel (e.g., police/security, janitor). Presenting false or misusing insignia, documents, and/or identification to misrepresent one’s affiliation to cover possible illicit activity. Stealing or diverting something associated with a facility/infrastructure (e.g., badges, uniforms, identification, emergency vehicles, technology, or documents [classified or unclassified] that are proprietary to the facility). Damaging, manipulating, or defacing part of a facility/infrastructure or protected site. Compromising or attempting to compromise or disrupt an organization’s information technology infrastructure. Communicating a spoken or written threat to damage or compromise a facility/infrastructure. Operation of an aircraft in a manner that reasonably may be interpreted as suspicious or posing a threat to people or property. May or may not be in violation of Federal Aviation Regulations.